Gideon Coe begins a summer of festival coverage with Radiohead live from the Pyramid Stage at Glastonbury 2017. 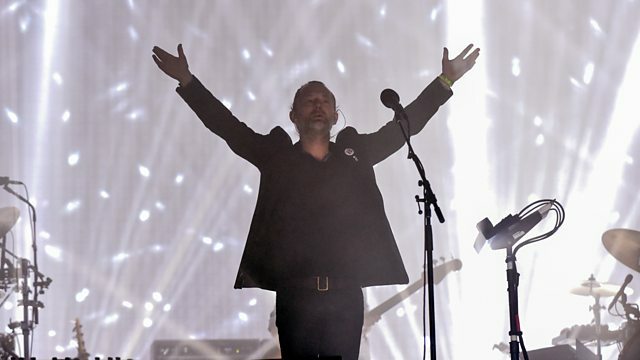 Gideon Coe begins a summer of festival coverage with Radiohead live from the Pyramid Stage at Glastonbury Festival. This will be the band's third time headlining Glastonbury, following historic stints in 1997 and 2003. Listeners will be able to experience all the excitement and build up to the set and reactions afterwards. There will also be live music from Anderson Paak and the Free Nationals, Sleaford Mods and Angel Olson will be joining Gideon for a chat in the studio after her performance on the Park Stage earlier in the evening. 6 Music brings you the very best documentaries and coverage from this year's festival.